Navajo Pearls alternating with fluted silver beads... 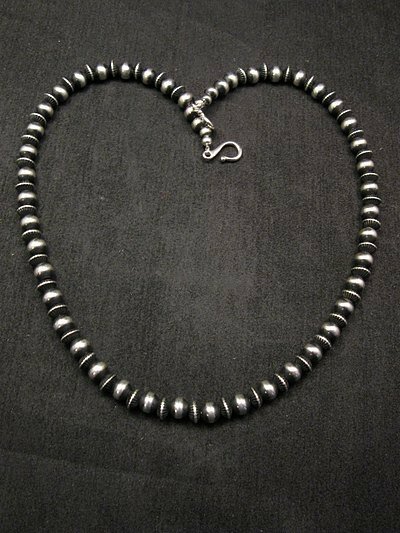 Native American Sterling Silver mixed bead necklace. 20 length. 7mm beads. Looks great alone, layered or with a pendant of your choice. Item#6464. Length: 20 inches end to end. 7mm beads. A lot of people use the term bench bead incorrectly. The definition of bench beads are beads that are partially manufactured and partially hand made. Usually the silversmith starts with some machine cut pieces, which are then soldered and strung by hand. 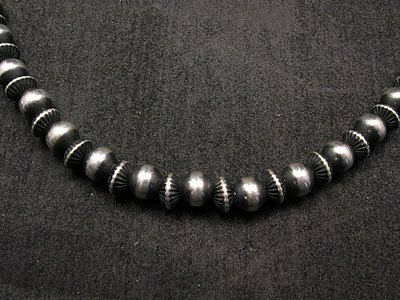 In this case, each HALF of a bead is machine made and then the Navajo silversmith solders the two halves together, then polishes and finishes the beads with an oxidation process and strings the necklace by hand. Brand new in perfect condition. Gift box included with your purchase. 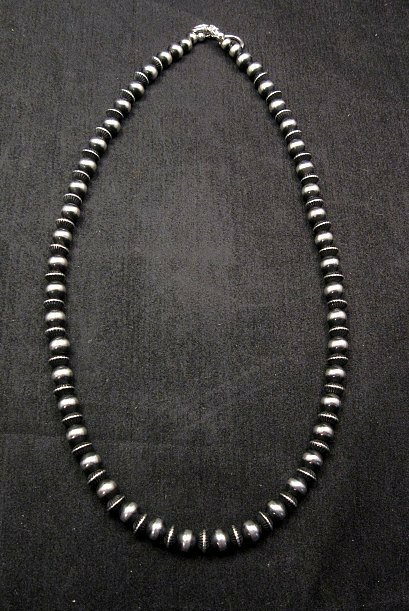 We have many Navajo Pearl necklaces available in different lengths with different sizes & types of beads.